The Vegan Magpie: Vegusto cheese offer! Hello! 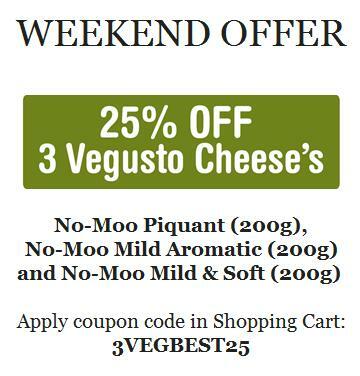 This week's Vegusto weekend offer is all about cheese! Until Monday 24th July at midnight, they are offering 25% off of their best cheeses: no-moo piquant, mild aromatic and mild and soft. Yay! Just add the 200g packs to your basket and use the code 3VEGBEST25 at the checkout. Vegusto often do weekend offers that come by email, so if you're interested in Vegusto, I highly recommend signing up to their newsletter (at the bottom of their web page). Don't forget to add postage costs when considering an order.